NW Children’s Foundation strives to maximize the impact of every donor dollar. We run an extremely efficient organization, relying on and benefiting greatly from contributions of time and talent by Board members and other dedicated volunteers. Extensive organizational checks and balances ensure accuracy, accountability and integrity in our stewardship of donors’ contributions. 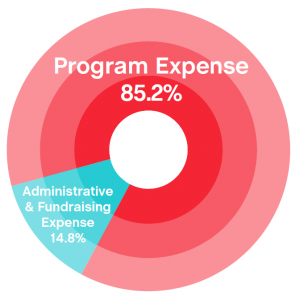 We secure underwriting of all operating expenses through Board member contributions, ticket sales and corporate sponsors, so that 100% of individual donors’ dollars go directly to helping abused and neglected children. Detailed financial information may be found in our annual form 990 filing and our annual report. * In addition to the donations above, NW Children’s Foundation received pledge payments to the Mary Ketcham Kerr Endowment, which had reached a total value of $1,143,788 at the end of the fiscal year. **NW Children’s Foundation maintains a reserve equivalent to approximately three to six months of its operating expenses. For the fiscal year ending July 31, 2017, NW Children’s Foundation’s total revenue was $1,601,883, program expenses were $1,183,807, and ending net assets were $1,345,027.